One for our UK readers this one: Goals are opening up a brand spanking new centre in Manchester. It opens this Sunday, 22nd February. Roll on the good times! 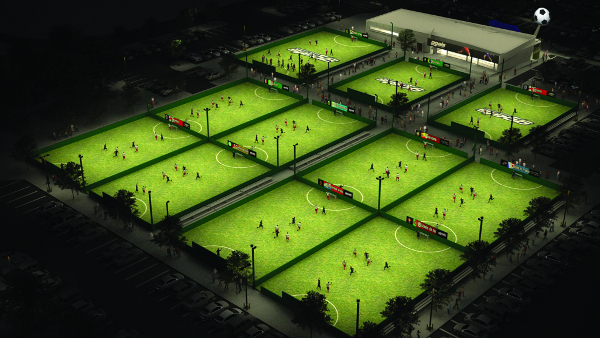 Goals Soccer Centres, giant of UK 5-a-side, is opening yet another multi-million pound facility, this time in Manchester. This will be their 46th centre and will feature both 5-a-side and 7-a-side floodlit synthetic turf football arenas, changing facilities and a licensed sports bar. All pitches will feature the latest “5G” synthetic grass and on-pitch cameras will capture all the goals, action and excitement for teams to share on social media. You’ll be able to get your regular leagues (for all ages and abilities) plus it will also host tournaments giving you the chance to get your hands on some prizes. Keith Rogers, Goals CEO said “Bringing the Goals experience to Manchester is a massively exciting time for us. 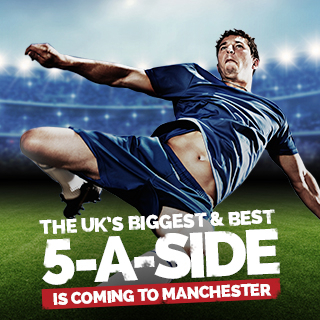 To bring the UK’s best 5-a-side facilities to England’s home of football is a perfect match. Goals are pretty excited about it, and why not? It’s an exciting opportunity to put a facility like that in one of the most iconic footballing cities in the world. Organise your game via the app & get £10 off your game (T&Cs apply). FREE set of strips to the first 50 league teams. Half price parties for the first 50 bookings. FREE DJ & function suite hire for the first 20 bookings. If free stuff and good football sounds like your bag, you need to check them out by visiting their page at www.goalsfootball.co.uk/manchester or getting in touch on 0161 441 4560 for more details.